The most important part of a stamp is the rubber that it is carved from. Depending on how long you want to use the stamp and what detail you need, almost anything soft enough to carve will work. A few years ago I collected a number of erasers as I was getting ready to teach a class on stamp carving. It was fall and there were lots of back to school sales, so why not buy all the stamps? 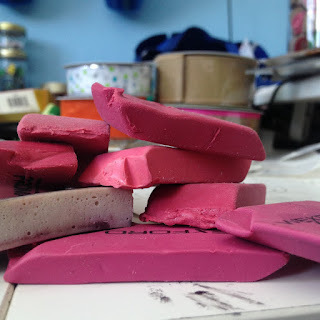 1) It can be difficult to tell which eraser is going to carve nicely until you try it out. Some carve just as well as the rubber made just for carving and some are crumbly. If this is your only resource then buy one or two and give it a try before stock piling the erasers. 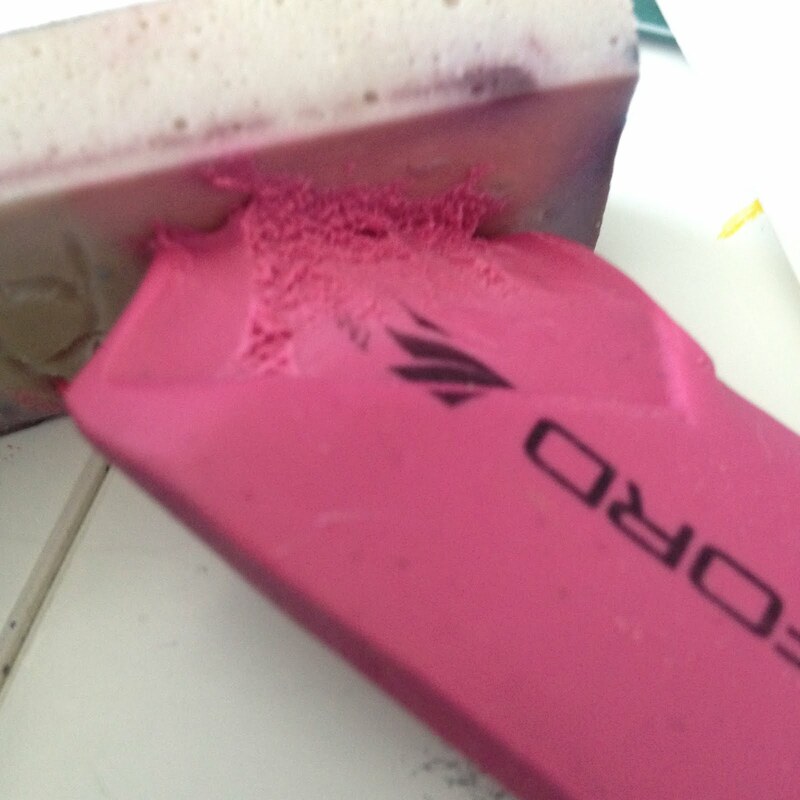 2) Some erasers are not very heat resistant. I'm not saying that an eraser has to be able to sit on the stove or sit under a hair dryer but . . .well just look at the photos below. . . 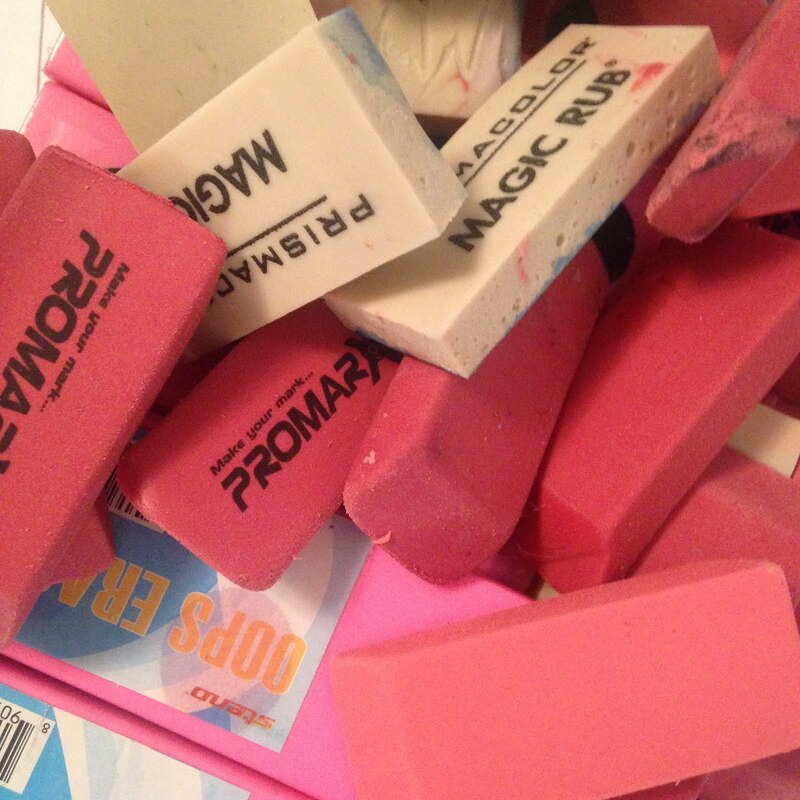 These erasers have been sitting in a clear plastic box in my studio. As far as I know, they haven't been exposed to incoming light, or been near the heating system in the house, yet some how they melted. During Carve December I didn't use any of these small erasers for my stamps, although I think I should have used the time to use some of them up! 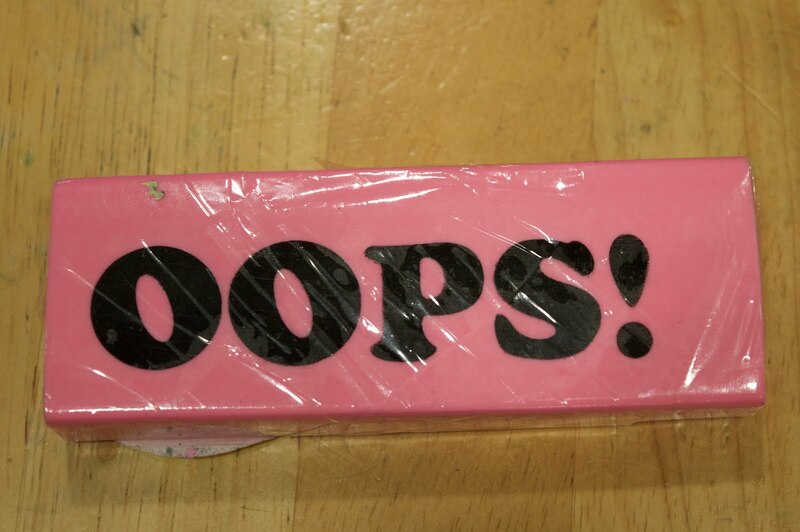 I did use some of the larger Oops erasers I have though. I found a number of them for half off at Walgreens one year and then my friend found another large number of them for 90% off! They carve nicely and are very thick. I can easily carve both sides to make a double stamp. They do feel gritty when you are carving them but the grittiness can be removed with a little soap and water. 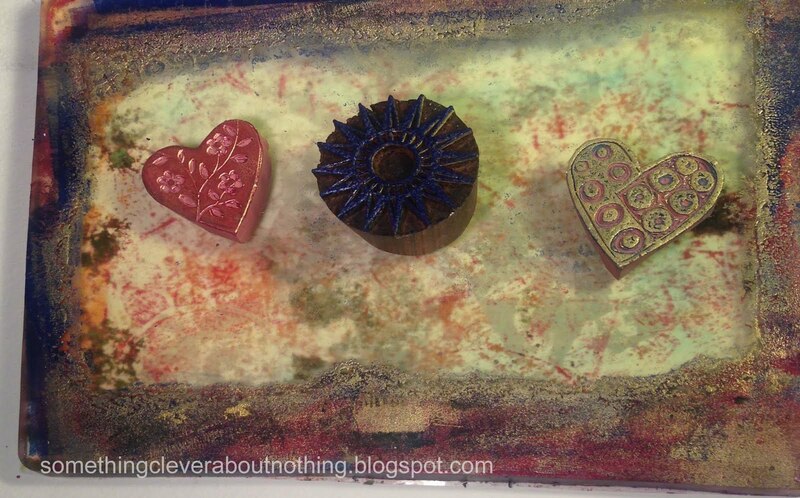 The three other carving materials I used during Carve December were : Speedy Cut, Speedy Carve and Eco Karve. 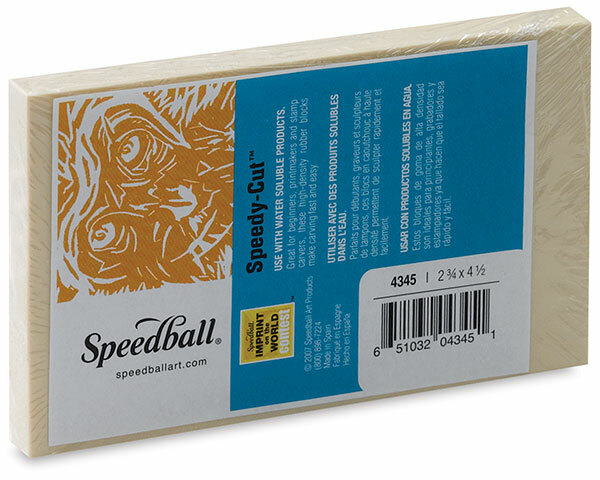 Speedy Cut is one of the easiest blocks to carve through, and it is thicker than some carving material so it is easy to handle. I had a large sheet of it so I created a lot of stamps from it. I really like how these stamps came out. 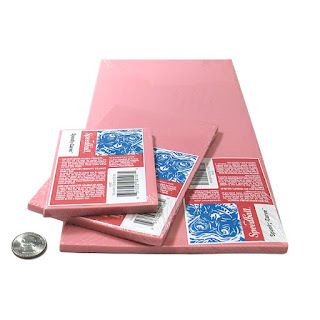 The material is soft, making carving very easy, but it also means it's a little easier to slip while carving and for small pieces to break off of the stamp. I left one sitting on my studio table and when I came back a bit of an edge had disappeared. I don't know if I knocked it into something or a cat did, but it was annoying to have it messed up so easily. Speedy Carve is thinner and more firm than the Speedy Cut. I like having a little resistance when carving. 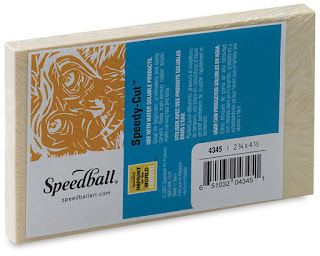 I did not have any issues with the Speedy Carve and really enjoyed making stamps from it. It isn't gritty or crumbly and prints a great image. I haven't had any problems with melting or breaking. Eco Karve is a product Dharma Trading sells. 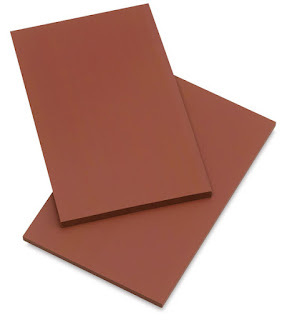 It is 100% recycled rubber, non toxic and latex free. It is thicker like the Speedy Cut and could easily be carved on both sides. It is just as easy to carve in to as the Speedy Carve and isn't crumbly or gritty. I really enjoyed carving the Eco Karve and was sad when I ran out. I need to order more. I'm just trying to decide what size plates and how many I should order next time! And the last material you need is ink or paint and something to stamp on to! During Carve December I used MementoLUXE, Encore!, and Color Box stamp pads and tried out each image in my Canson sketchbook. 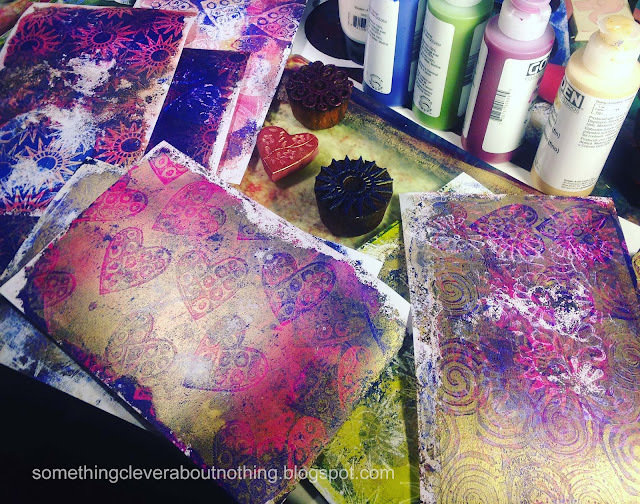 The other night I used my stamps with my Gelli® Plate and created some layered mono prints which I will be using to make cards with. I know I will use these stamps on fabric in the near future but I also plan on making some of them into larger images that I will print onto larger pieces of fabric. if you have any questions don't be afraid to ask! Thanks for the info on carving materials, I have mostly used Moo Carve, but I think I have some of the orange stuff too. I buy dollar store erasers, this year they had a six pack of bright colors, they carve very smoothly. I went back and looked at all your carve December stamps, what fun! Love the hearts and the Celtic knots used as a chain.